One of mocha‘s strongest features is the flexibility of the tracking and shape data you can create with it. In this month’s free training webinar, Ben Brownlee, VFX artist and Curious Turtle trainer, works through some real-world examples of using mocha in conjunction with After Effects and Boris Continuum Complete to tackle a number of challenges. Transform an ordinary scene by shifting the time of day and animating static elements within the scene. Save time and get the results you want by taking advantage of stabilized pre-comps and 3D camera tracking. 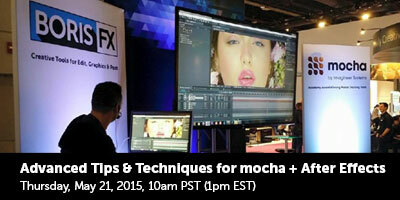 Plus, learn how a few straightforward techniques can make a huge difference in beauty work thanks to mocha‘s rotoscoping, shape-generating tools, and Lens and Stabilization modules. Previous Article X-Particles 3 Now Available!